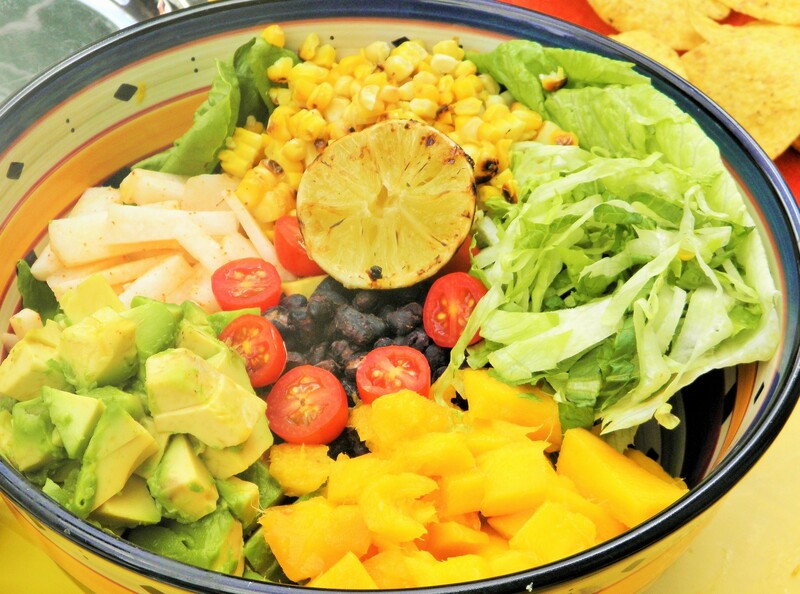 Super scrumptious summer salad with avocado, grilled corn, jicama, mango and black beans !! Yum!! I had made a double batch of the curried black beans when I made the Summer Lunch Salad, So this salad was a breeze to put together at the barbeque! To the jicama slices, add the salt and pepper and set aside. Combine the black beans, grilled corn, jicama, mango, lettuce, avocado and the grape tomatoes. Squeeze the grilled lime, juice, pulp and all! Toss and serve! If you do not have grilled corn, ‘roast’ the corn kernels in a pan.Heat 1 teaspoon olive oil in a pan over medium heat,add the corn and a pinch of salt and sauté it until the kernels are roasted. You can substitute 1/2 lime for the 1/2 grilled lime too. You may add grilled chicken to this salad too.